suspended on a chain of moons: one full moon, one at it’s crescent. Within the bark of the tree a face emerges. Hidden in the branches are scattered stars carved to look like a part of the bark. containing the potential of greater things. for those who lost their homes in a hurricane here in Virginia, 2003.
or simply email me for details. A tree framed in its own root and branch, suspended on a chain of moons: one full moon, one at it’s crescent. Within the bark of the tree a face emerges. Hidden in the branches are scattered stars carved to look like a part of the bark. This living circle presents how everything is connected: life offering itself to Life, containing the potential of greater things. 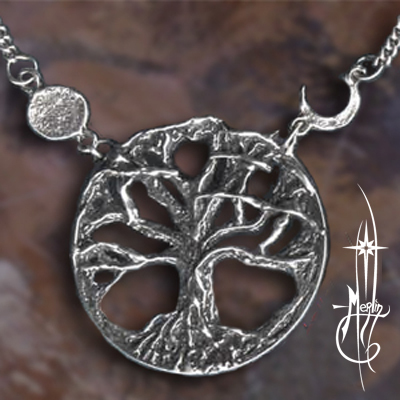 This Living Circle Tree Amulet was designed and created as a fund raiser/raffle for those who lost their homes in a hurricane here in Virginia, 2003. 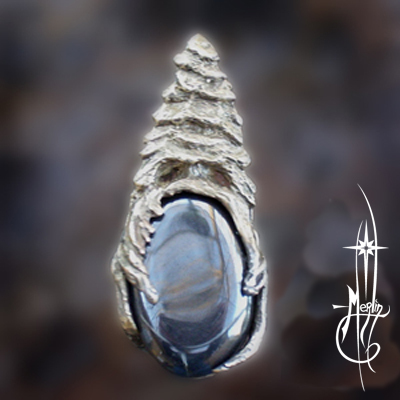 If you would like something like this, please visit my How to Order Custom Jewelry and Sculpture Page, or simply email me for details. Ever look up into the trees and think you see a face or critter in the leaves and branches; only to discover it was a trick of the eye? Folks have “seen strange things” in the trees for all of human history. In ancient days, the Druids attributed powerful influences emanating from the trees, sometimes one would spend a great deal of time in the woods to gain insight,attributing their inspiration to the trees. Buddha sat beneath a Bodi Tree when he gained enlightenment, Oden hung himself from a tree when he developed the Runes. Aside from burning wood for warmth, wood has been an intrinsic part of our society for as long as we have been aware: we descended from trees, we build our homes, our furniture toys and great works of art. Some of the oldest beings on earth are trees. In my own experience, I found great comfort amongst the trees: the might Sequoias of the west coast are impressive both in height, age and majesty. In one of my excursions into the forests of the great North West, I thought I saw “someone” high in the branches. I couldn’t identify who or what it was and so pursued what I mistook as a being. I even climbed up into the branches only to find “nothing there”. Later that day I saw it again, only in another tree. Squirrel? Not that big! It was when I was relaxed and “not paying attention” that I began to understand what I was “seeing” was the essence of the tree: something vaguely aware, coming from the forest itself. Comforting yet removed, alert yet extremely slow and paced, the Forest itself has a presence. My attempt to “capture” this in art I developed: The Tree Spirit Amulet. A noble tree with spreading branches, exposed roots alluding to how such a being is rooted both into the earth and the spirit world. In the branching of the tree is a small deer head, alluding to Herne, a being in the forest that is both a part and transcendent. The amulet may be worn as a pendant, but I have also created the Tree Spirit Necklace by adding hand made leaf chain and earrings. 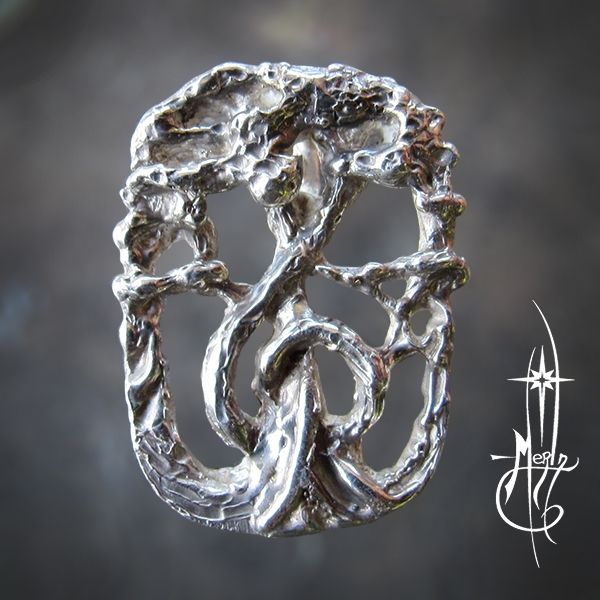 The Tree Sprite Amulet is for those who love the Trees for what ever reason, but most especially for those whose imagination have lead them to the truth about our Living World. 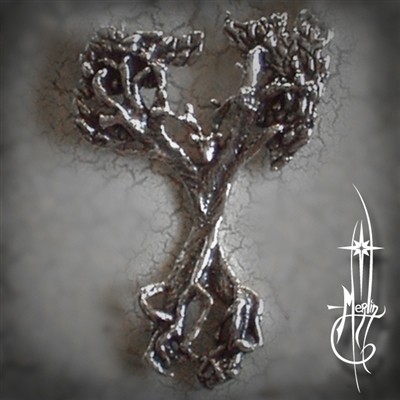 A new one of a kind Tree Amulet, featuring a hematite to develop a “null field”. Many of us are plagued with EMF sensitivity. The design is the meditation illustrated in the amulet. into the null field itself. specifically selected by the stone carver for this purpose. visible to those that see it. In reverse it is directed to specifically shield from that which is in front of him. One of a kind pieces, especially trees are one of my favorite things. This is the first evergreen tree I have made; others have included: oak, elm, maple monkey pod and willow, to name but a few. with your specific instructions and we may go from there.